Tableau is business intelligence (BI) tool that can help you create beautiful and visually-appealing reports, charts, graphs and dashboards using your data. These reports are interactive and can easily be shared with anyone. Tableau has a drag and drop interface. Tableau is a user friendly tool. Can connect to any data source like corporate Data Warehouse, Microsoft Excel or web-based data. Tableau creates dashboards in minutes. It is a paid tool and is available for 14 days trial version. All your development is done here. From creating reports, charts, formatting them, putting them together as a dashboard all the work is done on Tableau Desktop. Tableau desktop will give you full access to data sources. Deploy Tableau desktop dashboard to server. 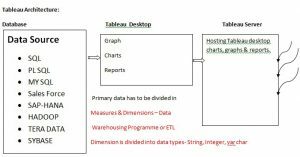 Tableau Server is a web application. Tableau Server is used for hosting dashboard. Server Admin related activities are performed like installation, backup, recovery, privacy etc. Tableau cannot connect to server based database files. Tableau public cannot host database to tableau server. Need to create your profile with public and you can publish workbook on your name on Tableau Public Server. By default Vizql process the Query and get all the data from the tables into tableau tables. Vizql easily understand the data types.